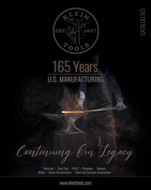 October 10, 2018 (Lincolnshire, Ill.) – Klein Tools today released additional insight from its “State of the Industry” survey, with input from more than 800 union and non-union electricians. 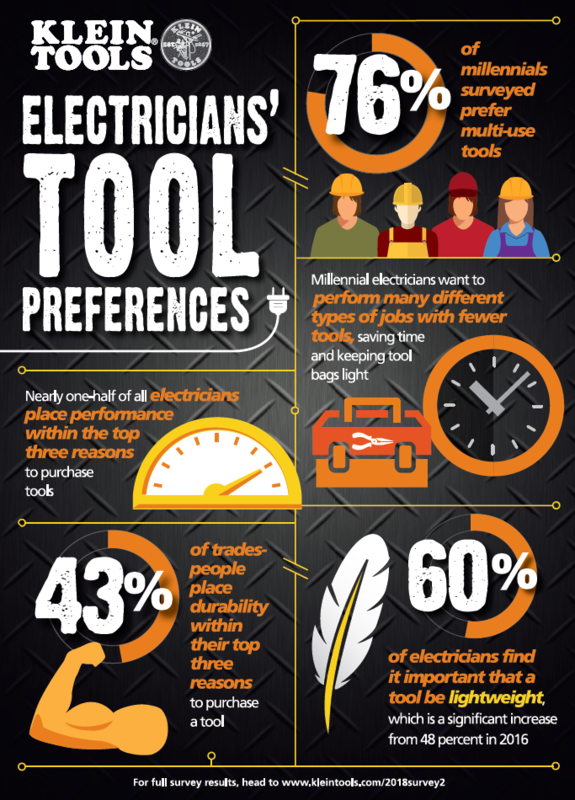 Survey results highlight preferred tool types among different generations of electricians; specifically, millennials’ preference towards multi-functional tools. The results also explore which tool features primarily drive purchasing decisions, including performance and durability. Results showed that more than half of electricians surveyed feel that multi-functional tools are not as important as other job-specific tool features. Millennials feel differently, however. Millennial electricians place more importance on multi-purpose features, preferring these innovative, convenient tools. Seventy-six percent of millennials surveyed prefer multi-functional tools over standard hand tools. This generation of electricians wants to successfully complete various tasks across different jobsites with a minimal number of tools, saving time on the job and keeping tool bags light. Among all generations, performance and durability remain the primary drivers for why tradespeople decide to purchase a tool – a constant since 2015. In fact, more than 90 percent of electricians find high levels of performance and durability very important or important when purchasing a specific tool. Lightweight tools have also become more in demand. Nearly one-half of surveyed electricians place performance within the top three reasons to purchase a new tool. Forty-three percent of electricians place durability within their top three reasons to purchase a tool. Sixty percent of electricians also find it important for a tool to be lightweight, which is a significant increase from 48 percent in 2016. More than 800 union and non-union electricians were surveyed for the Klein Tools “State of the Industry” survey by Russell Research, an independent survey research firm. Russell Research conducted 201 online interviews from Jan. 20-26, 2015; 200 online interviews from Jan. 27-Feb. 5, 2016; 200 online interviews from Jan. 10-18, 2017 and 200 online interviews from Feb. 2-14, 2018, to secure a nationally significant representation. Forty percent of respondents were union members and 60 percent were not. For more about the survey results, please visit: www.kleintools.com/2018survey2.